Valve Regulated Lead Acid, also known as VRLA batteries, use a gelled electrolyte and Tubular Plate technology. The chemical makeup provides the battery with outstanding performance abilities, and makes it very dependable. With a long life span and maintenance free design, this battery can be utilized in a number of applications. These include telecom, industrial, reserve power, utility and solar power systems. The construction of these batteries allows them to be mounted in multiple directions. Consumers turn to VRLA battery options because they offer a large amount of storage at a low cost. 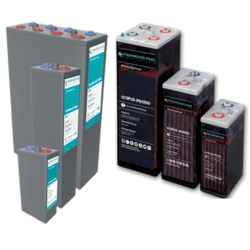 POWERSYNC is proud to offer VRLA batteries to consumers in either the AGM or the OPz option, as they provide better value when powering an application. 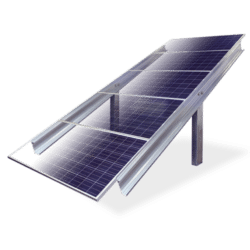 AGM batteries, also known as Absorbent Glass Mat, are the way to go if you want high performance, and a maintenance free battery option which do not require you to add water or to clean them. These batteries are a form of VRLA batteries. They provide higher performance ratings than conventional flooded lead-acid batteries do and tend to have a longer life span. 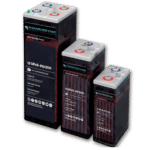 AGM batteries contain superior self discharging rates when compared to conventional batteries, and can be used in a wide variety of temperatures. 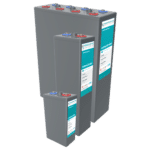 OPZ Batteries have an outstanding cycle life and is one of the best low cost options when it comes to solar PV energy storage for homes or businesses. OPzV is a Valve Regulated Acid battery which uses sealed gelled electrolyte and Tubular Plate technology. With a long dependable life span and maintenance free design, this battery can be utilized in a number of applications including telecom businesses, railways, electricity cabins, uninterruptible power supplies, ups, electricity and nuclear power plants, emergency lighting, microwave radio system and renewable energy systems.